Kidney disease carries a high burden for individual patients and for the medical system as a whole. End-stage kidney disease (ESKD) is associated with high mortality and decreased quality of life for many reasons including residual symptoms, pill burden, dietary restrictions, and decreased fertility. Kidney transplantation has benefits but is a limited resource, and the majority of patients with ESKD are on intermittent hemodialysis (HD) or peritoneal dialysis (PD). Home therapies can improve many of these patient-reported outcomes, but come with their own unique downsides, such as the burden of care for the patient and/or caregiver, equipment and supply storage, and utility and water purification costs. Kidney disease is also taxing on the medical system and cost Medicare over $34 billion in 2011. In a recent Perspective published in AJKD, Salani et al discuss three new modalities undergoing development and preclinical or clinical trials. These innovative modalities, the automated wearable artificial kidney (AWAK), wearable artificial kidney (WAK), and the implantable artificial kidney (IAK), aim to decrease the burden on patients, their families, and the healthcare system. Comparison of the WAKs and IAK. Table 1 from Salani et al, AJKD © National Kidney Foundation. The AWAK and WAK may sound like very similar therapies, and both use dialysate regeneration processes (to oversimplify, they use urease, water, and cation and anion exchange columns to convert spent dialysate to fresh dialysate). However, AWAK technologies are PD-based, using frequent (8 times/hour) 500cc exchanges, which are subsequently pumped through a purse-like storage module for toxin removal and dialysate regeneration before being returned to the peritoneal cavity. The ultrafiltrate (UF) is drained into a bag and can be discarded when the cartridge is replaced, which is required every 7 hours. Benefits of the AWAK include higher cumulative flow into and out of the peritoneum, resulting in improved clearance compared to conventional PD (though, importantly, resulting in a creatinine clearance of approximately 30cc/minute, not a normal GFR). Smaller dwell volumes may reduce pain, hernias, and cost and burden of large dialysate volumes. A study of 20 male patients showed the safety and efficacy of the AWAK, though risks over time, including peritonitis from regenerated dialysate, hyperglycemia, membrane failure, and encapsulating peritoneal sclerosis (EPS), must be assessed. The AWAK system: tidal exchanges are done with 500 mL of spent dialysate being drained from the peritoneal cavity to the storage module, cleaned in the sorbent cartridge, replenished with electrolytes in the enrichment module, and returned to the peritoneal cavity. Excess fluid is drained in the ultrafiltration bag to be disposed of with the disposable module shown here. Redrawn from an image supplied by AWAK Technologies, Ltd. Figure 1 from Salani et al, AJKD © National Kidney Foundation. In contrast to the AWAK, the WAK is a blood-based device which connects to a dual-lumen catheter (as use of a fistula would pose a threat of needle dislodgement). To deal with electricity and water issues, one 9-volt and several AA batteries provide power to the pump. Only 400cc of sterile water, 0.45% NaCl priming solution, and heparin via a syringe pump are needed. Pulsatile and alternating blood and dialysate flow allow low blood flow rates (~100cc/minute) with adequate clearance. Similar to AWAK, dialysate is regenerated, and UF is collected in a waste bag. Preclinical and clinical trials of the WAK showed CrCl of approximately 20cc/minute, with adequate management of electrolytes and acidosis. Potential complications include those typical of central venous catheterization, especially infection. 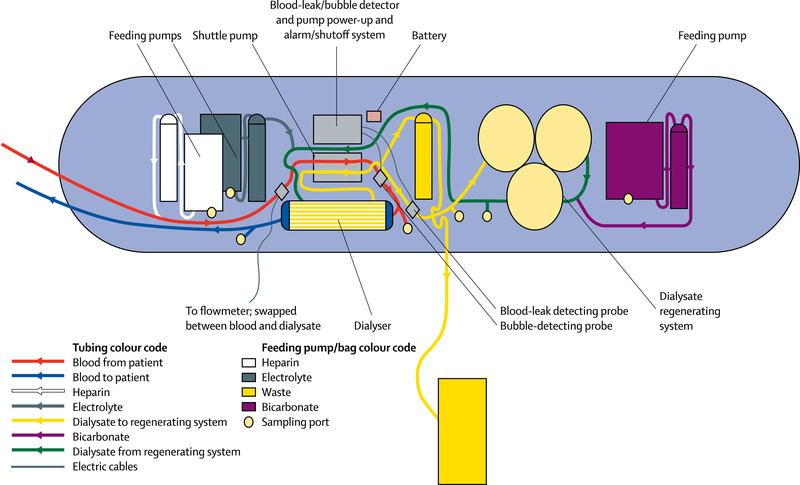 Schematic of wearable artificial kidney (WAK) system. Blood from the catheter is anticoagulated using the heparin pump. A shuttle pump pumps blood through the dialyzer. The blood is reconstituted with electrolytes and returns to the patient. The dialysate goes through the dialyzer and the spent dialysate goes to the dialysate regenerating system to be used again with any excess dialysate discarded into the ultrafiltration bag. The system has alarms in place for leaks or bubbles. Image is ©2007 Elsevier Ltd and is reproduced from Davenport et al with permission of the copyright holder. The IAK is a novel technology which is currently in the preclinical phase and aims to incorporate silicon nanotechnology with cultured renal tubule epithelial cells to mimic a native kidney. The patient’s arterial flow provides the pump, and no dialysate is needed due to a BioCartridge which, after filtration by a HemoCartridge, returns salt, water, and glucose to the blood. The result is production of a concentrate full of toxins, similar to urine, for excretion. Careful engineering protects blood from shear forces and stagnation. Biocompatible polymers coat the silicon membranes, thus allowing for anticoagulant-free implantation in animals for up to one month thus far. Advantages of IAK include continuous filtration by a porous membrane reminiscent of the glomerulus, with a silicon scaffold between the tubule cells and the patient’s immune system, obviating the need for immunosuppressive medications. Production of urine-like liquid waste (approximately 2-4 liters per day) provides volume management and the patient’s oral intake can be adjusted accordingly. Use of human tubular cells may allow for use of cadaveric kidneys which have not been deemed suitable for transplant, and for use of stem-cell derived kidney technology. However, importantly and similar to the AWAK and WAK, expected CrCl would be approximately 30cc/minute, which has implications for already-existing management of chronic kidney disease (CKD) complications related to anemia, bone mineral disease, and electrolytes. Limitations of this technology may include mammalian cell culture stress and maintenance of years of thrombus-free operation, and these challenges must be overcome as ongoing development and trials of the IAK continue. the vasculature with blood pumped using the patient’s blood pressure into the HemoCartridge with membranes that mimic the slit-shaped pores of podocytes and then through the Bio-Cartridge that contains living tubular cells, thus mimicking the glomerulus-tubule arrangement of the kidney. Figure 3 from Salani et al, AJKD. Development of the AWAK, WAK, and IAK provide excitement and hope for improving quality of life, clinical outcomes (via essentially continuous therapy), and costs associated with ESKD. However, despite significant advances in these technologies, barriers still remain. The devices must prove safe and effective as preclinical and clinical trials continue. Patients and healthcare providers should understand limitations and implications of these devices, such as the need for cartridge replacement several times per day, implications of regenerated dialysate, potential for failed membrane or device (including need for one or more surgeries in the case of the IAK), and the potential need for ongoing medical management of CKD complications given the predicted CrCl of 20-30cc/minute with these devices. There has been widespread interest in when exactly these technologies may become available for clinical use; however, technical, regulatory, and financial challenges (including future coverage such as under Centers for Medicare and Medicaid Services) make it difficult to accurately predict the timeline to clinical availability. The goal of initiatives such as the Kidney Health Initiative and KidneyX is to cultivate partnerships between the American Society of Nephrology (ASN), the FDA, the Department of Health and Human Services, and researchers, innovators, and investors to increase collaboration and funding and to reduce other barriers to innovation in nephrology, in order to enhance care for patients with kidney disease. Considering how far we have come, with the first hemodialysis for CKD occurring relatively recently in the 1960s, the excitement for innovative ways to revolutionize care for patients with kidney disease remains strong, as does our commitment as nephrologists to continue to optimize the care we can provide. – Post prepared by Diana Mina, AJKDBlog Guest Contributor. Follow her @DiMiRenalMD. 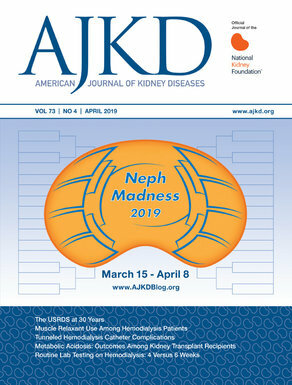 To view Salani et al (subscription required), please visit AJKD.org. 1 Comment on Portable and Implantable Artificial Kidneys: AWAK, WAK, and IAK, oh my! How long will it take to reach India and what will be the cost of it, so that everyone can get a relief.